I tried to make it accessible, with no deaths/lives, and give cues/prompts from Porter speaking to help guide the player. I'd be curious which particular aspect was hard, as it would help my design in the future. Nice game, buddy. It's pretty awesome how much you made with so little time. I had a hard time trying to figure out how portals work (manly cause I was trying to enter on then), so I think that man could have said ppl can't enter. After all, everyone that played Portal and Portal 2 before will try it. And I think that the sound of the box when it's falling in loop on the portals, is pretty annoying. But I think that in general, the game is cool, beautiful and kinda addictive. Thanks for playing and commenting, and glad you liked it. Cool game. I like the fact that you added controller support :) works fine with xbox controller. The art is very captivating, with a great color palette and fits with the game and with the jam. It has a bug in my Windows 10, like several games made in Game Maker, when I put on full screen, the game begins to lag. If you are going to continue with the project, I recommend studying a little of the level design of Portal 1 and 2 (which are probably your reference). Your level design lives up to the three-dimensional pioneers, however you seem to have stumbled into the problem they struggled to face that is when the player gets stuck. I think a planned level design would be more interesting than a "Reset Level" button. Hi, thanks for taking the time to play it and also to comment. Totally agree with you about level design. I had a concept of dropping a box out a chute if one got destroyed, but time got the better of me, and in the end the levels are so short all it broke was the story aspect really. Definitely can be improved on though, as well as adding more uses for the portals. Maybe for a future project. As for the lag, I've never heard of Gamemaker specific Windows 10 lag, and never experienced it, and I've been using GMS for ages. It only runs at 30fps, and just did a frame test, and it's over 1000fps. The code is pretty simple. If you're getting it on other projects might be something on your rig. Great job on this Peter! Puzzles are well conveyed, they can be tricky, but never unfair. You've done a real good job with the portals, very easy to understand. I Love the small details like blocks rocking after falling from a high place, that's the sort of stuff I really like. Carrying/stacking of the boxes feels pretty solid. 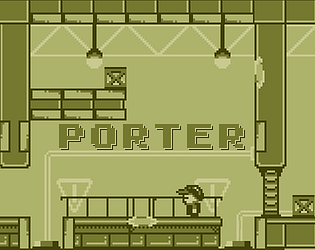 I might suggest working on the gravity/physics of the player a little bit, I feel Porter is a little on the floaty side, but that's more personal preference. I found a few little things that have already been mentioned and one big thing that will need to be looked at. You left the debug buttons in by the looks (R = restart). You can hold a block, jump, drop then walk into the block and it seems to reset your jump, meaning you can jump in midair. EDIT: You can jump, press B then jump straight after, you'd don't need the block. Other than that, you've got a really cool little game here, great job! Thank you so much for taking the time and giving feedback, I appreciate it. Details are hard to find time to add in a jam, but I agree, the polish is what I really enjoy adding. Would love to have had time for more. Agree about the floatiness of Porter. After the jam I'll change it a bit. I had left it like that so he gets knocked more when a moving box hits him, but I'll adjust it and only let it be like that when that occurs. As for the jump bug, that's a nice find. Something I hadn't actually tried. Was a state change problem, and have fixed it now so will update post jam. Great feedback mate, you obviously tested all the systems for problems, so appreciate the thoroughness. Once again, thanks for your time. Good luck on Flynn, I love so much about it, and talking of polish, Flynn just has it in spades. I've played the demo, so can't wait to play the full when it's released. haha, thanks for even playing, glad you liked it. Hey, thanks for playing! Yeh there's a few bugs I'd like to work on, but what can you do, it's a jam and time is limited. Sound repeating is one on the list for sure. You can always hit tab/select and restart the level.